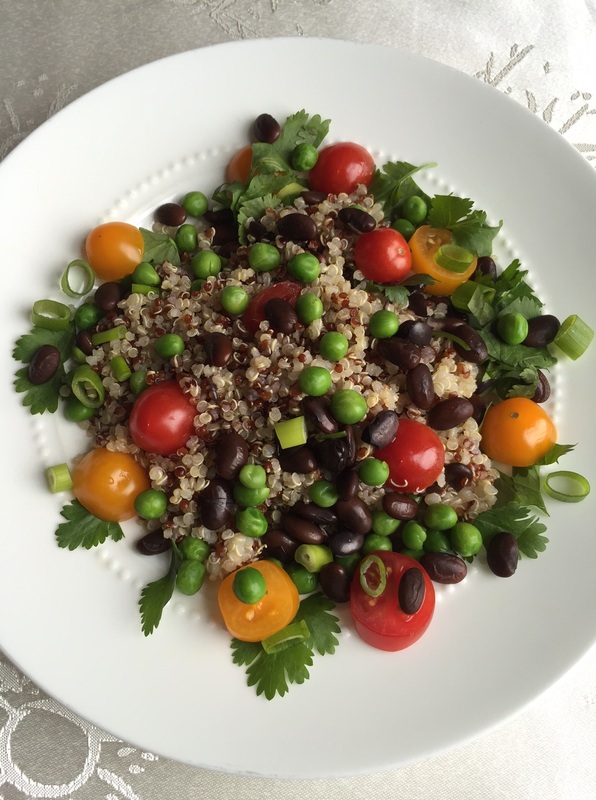 Red and White Quinoa with black soy beans, yellow and red cherry tomatoes, green sweet peas, parsley and scallion. This delicious salad is very colorful. It has as many nutritional benefits and colors. It will brighten your day, gives you energy, satiates you. It takes 5 – 10 minutes to compose this salad. Excellent choice for “take to work” lunch or a light dinner. In a stainless steel pot pour olive oil and turn hit on. Slowly add white and red quinoa, cold water, and sea salt. When the water starts boiling, lower the flame and cook for 20 minutes. Do not stir the pot. When it is ready, water should be completely absorbed by the quinoa. Put beans in a glass or stainless steel bowl and add cold water. Let it soak for 6 – 10 hours. Discard this water, rinse well. Put kombu in the cooking pot; add soaked beans and water. When beans start boiling remove foam with skimmer , cover with lid and let them cook for 60 minutes. After beans are cooked they still should be covered with water. Mix of freshly squeezed lemon juice, a few drops brown rice vinegar, ½ ts umeboshi paste, 1 TS olive oil. This entry was posted by Chava. Bookmark the permalink. It is very delicious salad. I will definitely make it. I made this salad. It was delicious. Easy to make and very satisfying. The only ingredient hard to get was umeboshi. We got pickled plums in the korean market and used a blender to make a paste. I will add this salad to my repertoire. Thank you! Misha Bagga on What about Mushrooms?